If you were planning to purchase the Galaxy S4 from AT&T, there is good news for you because AT&T has revealed the price and the ship date of the new flagship smartphone from Samsung. AT&T Samsung Galaxy S4 pre-order is now live and the smartphone that was officially unveiled mid March is now listed as available, with the shipping starting as of April 30th. The 16 GB Samsung Galaxy S4 has a price of $199.99 after signing a 2 year agreement with AT&T and is available in both Black Mist and White Frost liveries. 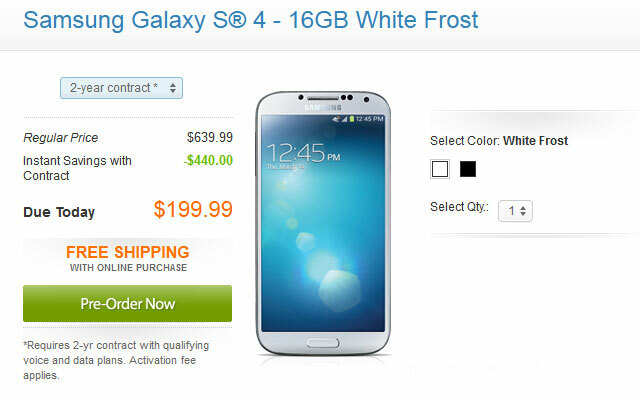 AT&T has also listed the full price of the Samsung Galaxy S4 which was set as $639.99. If you don’t want to be tied on a two year contract you can also by the Galaxy S4 from AT&T with a one year agreement, but you will have to pay $499.99 for it. The AT&T Samsung Galaxy S4 pre-order page doesn’t mention whether the device will also hit the store shelves of the carrier on April 30th. In case you were wondering whether it’s worth spending $199.99 and signing a two-year year contract with AT&T, I remind you that the Samsung Galaxy S4 sports a 5-inch full HD display with Super AMOLED technology, while being powered by a quad-core Snapdragon 600 chipset with 1.9 GHz Krait cores and Adreno 320 GPU, plus 2 GB of RAM, and microSD card slot. The smartphone has all the connectivity features of a modern smartphone like 4G LTE, WiFi in all standards, NFC, infrared port, and Bluetooth 4.0.